The Art of Naming: Favorite Names? 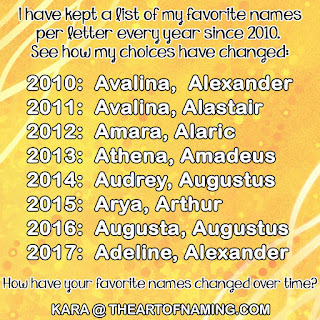 What are your favorite names? In the form below, submit your favorite first and middle name combinations for boys and girls! Two winners, a boy name and a girl name, will be chosen based on the votes on the polls. In case of a tie, I will make a secondary poll to determine the winner. Those two winning name combinations will be displayed on the cover photos of our Facebook Page and Twitter Page so be sure to follow those accounts to find out if your name submission won! Be creative and submit only the very best names you can think of! Thanks for playing!